Soldiers serving with the 864th Engineer Combat Battalion (Heavy) prepare a memorial honoring Sgt. Cory Clark and Sgt. Bryce Howard. 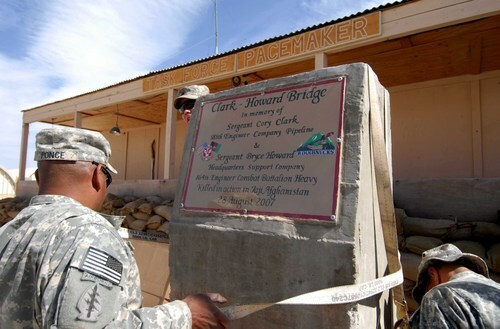 The memorial was commemorated at Combat Outpost Herrera, which is named in honor of SFC Ricky Herrera. 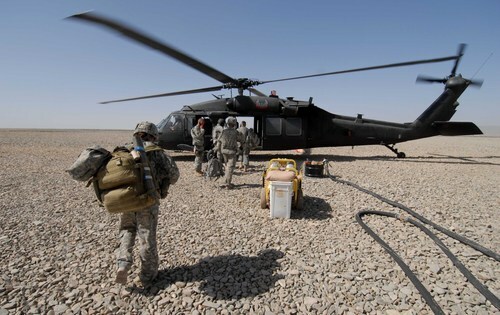 Late last August, a suicide bomber walked up to a group of American soldiers and Afghani civilians in the town of Jaji and detonated. Among the dead were SFC Rocky Herrera, Sgt. Bryce Howard and Sgt. 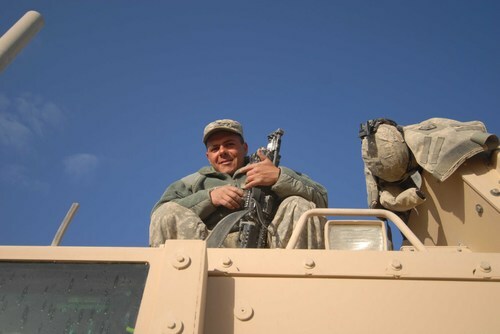 Cory Clark, all soldiers serving with the 864th Engineer Combat Battalion (Heavy) that is currently deployed to eastern Afghanistan. The three soldiers were helping to build a bridge for the people of Jaji. The battalion has memorialized these three soldiers. Combat Outpost (COP) Herrera is named in memory of SFC Herrera. And today, a stone monument bearing the names of Sgt. Howard and Sgt. Clark was placed near the just opened Clark-Howard Bridge. “It’s our way of remembering these soldiers and what they did for their country,” commented Maj. Kenneth Frey, the battalion’s operations officer. I agree. What these soldiers have given for this country should not be forgotten. Editor's note: J.M. 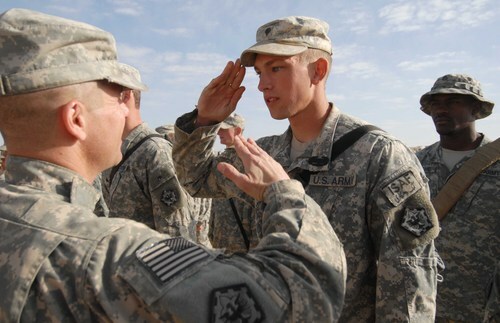 Simpson covered Fort Lewis Stryker soldiers in Iraq during four trips there from 2005-2007. 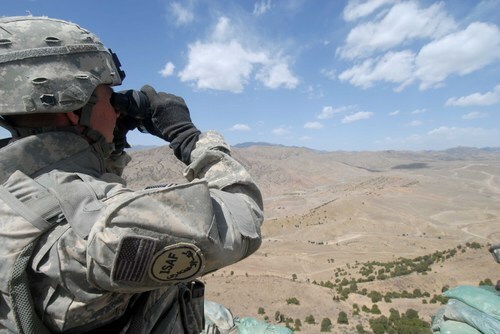 Last week, he flew to Afghanistan to get the other story, as seen through the eyes of Fort Lewis's soldiers from the 864th Engineer Battalion. The following is his first filed story. 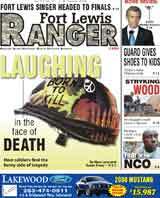 John's full features will begin March 27th in the Fort Lewis Ranger newspaper. 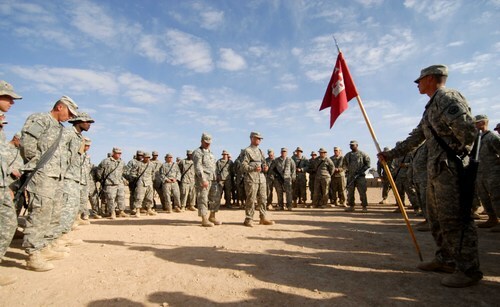 I will say this for the soldiers of the 864th Engineer Combat Battalion (Heavy) – they sure work hard here at FOB (Forward Operating Base) Sharana in completing all of the tasks they have prior to returning home in May. “We’ve got a lot of work yet to do,” commented Christa Bowman as she checked her level to ensure that a doorframe was perfectly vertical with the ground. “But I think we will get it all done before returning home,” she added. And as I have already pointed out, coming home for these soldiers is just around the corner. Located south of Kabul in eastern Afghanistan, FOB Sharana is still a relatively desolate place in the middle of nowhere. 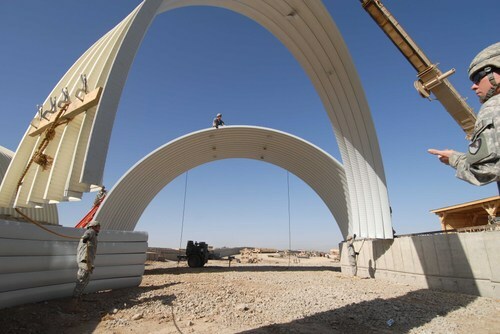 It serves as a hub for construction projects all across the eastern part of Afghanistan in support of Operation Enduring Freedom. 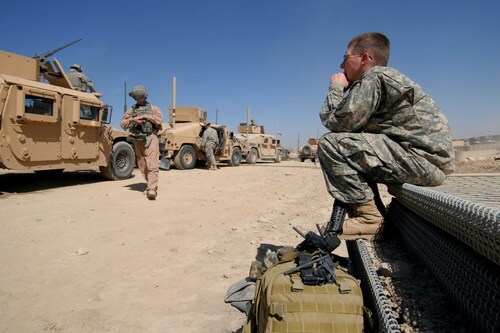 That said, soldiers don’t complain about their quarters, the food or the internet/telephone accessibility. FOB Sharana is a beehive of activity with construction – both of the horizontal and vertical variety – going on as the FOB grows in size. 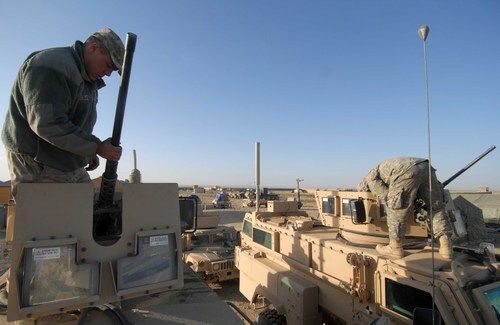 From digging and the driving of nails to welding and the pouring of cement, the battalion’s soldiers are doing it all. It should also be noted that members of the Polish Army at times work with their American counterparts. The weather here has been warm during the day and cool during the night. The one meteorological occurrence, which has struck me, is how blue the sky is. Puts me in mind of the skies over Montana. The 27 March issue of the Ft. Lewis Ranger newspaper will carry my story on what I have seen and experienced during the last couple of days. In the meantime, I will continue to write about and photograph the work the battalion is doing outside of the FOB. 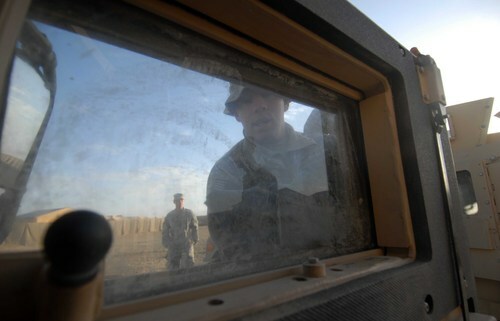 More photos from our man in Afghanistan, J.M. Simpson. Spc. 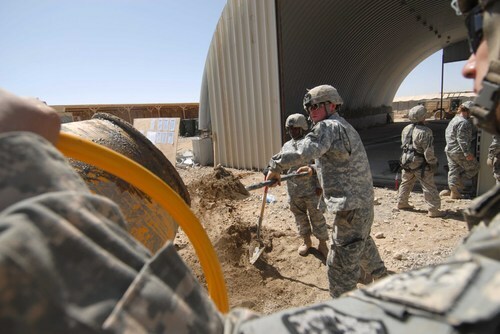 Steven Spencer, 2nd Platoon, Bravo Company, throws a shovelful of sand into a cement mixer during the construction of a K-Span building. Brig. Gen. Joe Votel, Assistant Division Commander, 82nd Airborne, coins Sgt. Clive Dunrod, 864th ECB (H), during a brief stop at FOB Sharana. Other 864th soldiers receiving coins were Spc. Joe Brazell, Pfc. Joshua Weiss, Pfc. Vincent Valenzuela, Pfc. Justin Nation, Pfc. 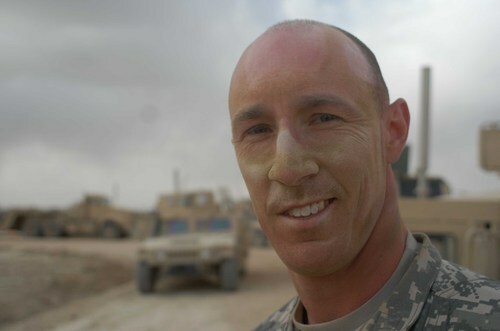 Robert Mack, Sgt. Jamie Schwilk and Spc. Anthony Gulino. 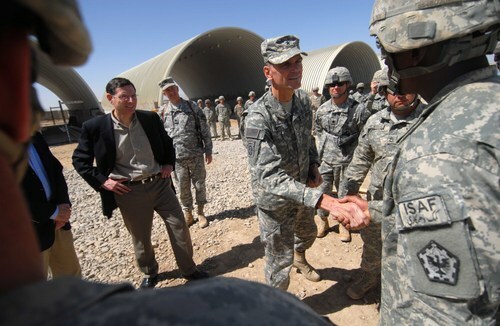 Standing behind Votel is Sen. John Barasso (R) of Wyoming. Pfc. Vungh Khai, 1st Platoon, B Company, gets a hand from another soldier as he prepares to work his way up the roof and seal a seam. 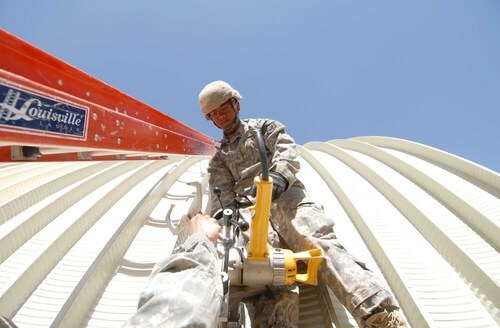 Soldiers from 1st Platoon, B Company work together to place a section of roof - called a K-Span - into position. Each roof contains 15 of these spans. Spc. 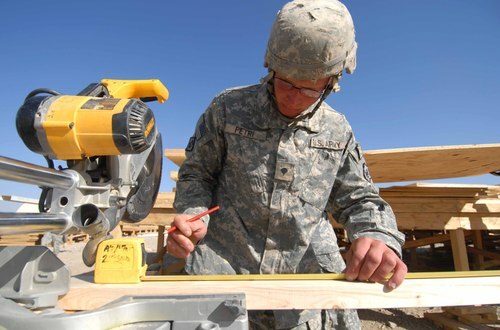 Josuha Petri, 1st Platoon, A Company, 864th Engineer Combat Battalion (Heavy) measures a two-by-four for cutting. The wood was used to make help support interior walls in structures referred to as K-Huts. Spc. 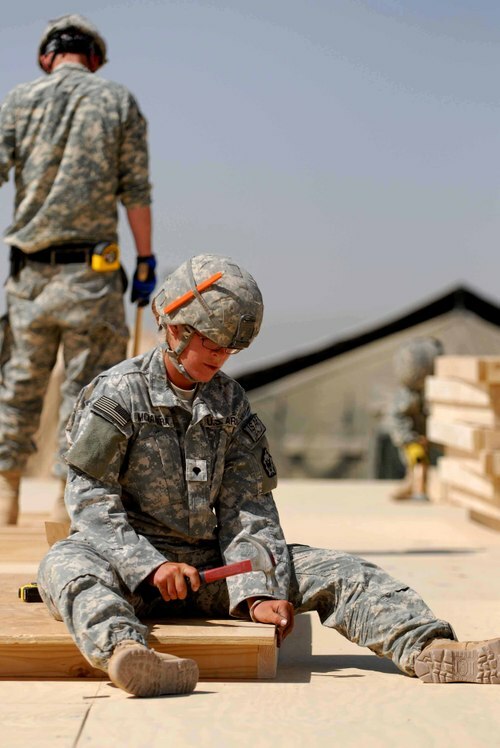 Heather McNamara, 1st Platoon, A Company, 864th Engineer Combat Battalion (Heavy) drives home a nail while working on the construction of new quarters at FOB Sharana for civilian contractors.